Is The 2015 Nissan Titan Diesel Almost Ready? 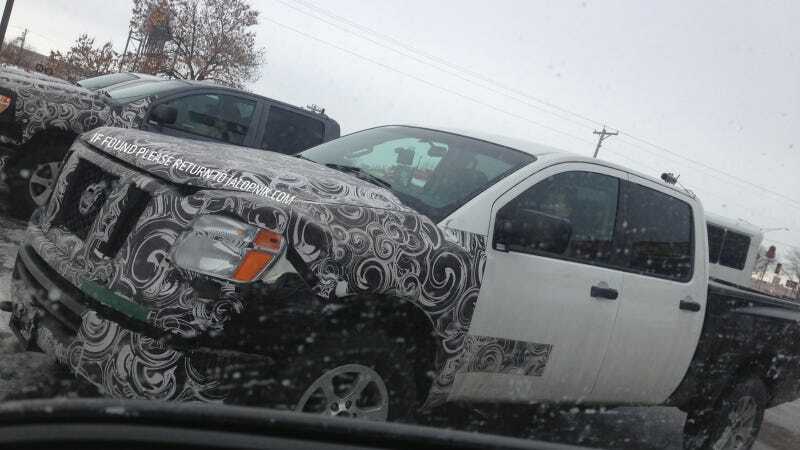 Three camo'ed Nissan Titan pickups were spotted by someone who swears he heard the telltale rumble of an oil burner. Is the truck's new Cummins diesel and its first redesign since introduction finally almost upon us? Last summer Nissan announced that a 5.0 liter Cummins ISV diesel V8 would be available in the next Titan, but we've yet to hear when the new truck will drop. We've also been hearing reports of Titan test mules running around for months now, including what looks like this exact one spied by AutoBlog testing towing abilities last June. But this is the first claim that the tester is indeed a diesel, and the first sighting I've been able to find of multiple new Titans in the wild together. Fred Diaz, a Nissan VP poached from Ram last April, told The Detroit News that the new Titan would be on sale "not soon enough," adding "I think you're going to see a lot more proliferation of diesel going forward. We're studying the possibility of diesel being in more of our products going forward." Reader itshouldahadaV8 took these photos at a gas station in Beloit, Wisconsin telling us that all the trucks had standard Michigan plates and were being followed by the "small white bus" you can just see in the top photo. "They definitely weren't Nissan reps driving them, the driver of the dark gray one looked to be about 17," he noted, and speculated that they might have been heading north for cold weather testing. What else would Nissan prototypes be doing in Wisconsin? Nissan's US production facilities are in Tennessee and Canton, Mississippi. Their Technical Center responsible for new product R&D is somewhat closer in Farmington Hills, MI, but that's still a 400 mile hike to Beloit. If that's where these trucks left from and it is indeed the same one AutoBlog saw, Nissan is definitely well into long-term real world testing of the next Titan. Also worth noting is that there's a large manufacturer of electric motors and other industrial products called Regal based in Beloit, so it's possible that they're involved with the truck. Diaz did hint at new technologies when discussing the next Frontier with Detroit, saying "It may be all-gas. It may be diesel. It may be a hybrid. There's so many things we're looking at right now." General Motors also owns a production facility in nearby Janesville, but it of course has not been operating since 2009. With GM's new full-sized pickups just on the market, Ram EcoDiesel new for this year, and the new 2015 Ford F-150 and Toyota Tundra going on sale soon Nissan's got a lot of ground to make up with their next Titan and capturing all the brand awareness that Ram built up with its Cummins diesels can't hurt.